My friend talked about watching Blood Out this weekend. I almost want to watch it just to see a certain favorite someone strut his stuff. 😉 He looks good in that movie. It’s been over a week since I’ve had to walk to work. The walking wasn’t so bad. It was the no cafe mocha coupled with no tea that got to me. I never stop for Starbucks when I walk because I don’t want to have to hold my drink while I’m walking. I usually have tea on those non-Starbucks days but when I got to work, I discovered that I had no tea. OH NO! So what to do? Well, I waited until someone made coffee and I poured myself some. Still love ya, Greg! Check your email, darn it! 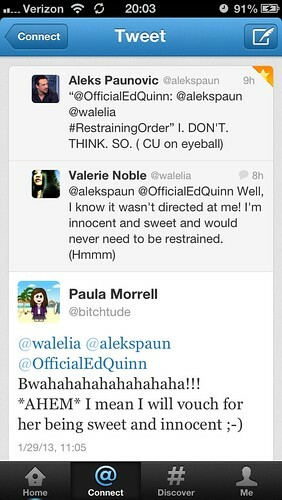 You didn’t get Aleks’ reply to Ed’s restraining order 😉 I think they can be smartasses all the way around, LOL! Now I know where the pics on Ed’s FB came from! I saw some of him with the tat on his neck, looking a bit gangsterish but didn’t know what show that came from. Looks like he’s playing a bit of a bad guy? Definitely must watch Blood Out now. Please, oh please,PTB, Ed concert in May! I could get 2 things accomplished at once and I’d be one happy camper 🙂 And I promise to try and be good for the rest of the year! Ed plays a bit of a bad guy in Blood Out. You most definitely must watch the movie. LOL! That’s the one. I love his “CU on eyeball” 😀 (CU meaning close up in case anyone is wondering.) They need to do some videos of band practice. That’d be totally cool! Maybe I’ll suggest it? I’ll have the blu-ray on Thursday so will watch, cap, review this weekend assuming I ge those edits done to my story! 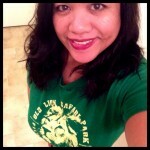 I keep getting sidetracked by someone, LOL! Ohhh, blu-ray. I don’t know if I like the movie enough to get it on blu-ray. Maybe if I find it at Best Buy for cheap, I’ll pick it up and risk the hubby eye roll. LOL! I’m sure the blu-ray will come down in price by next year. And I just looked through all your caps on Flickr. So very, very yum! I’ll ask on Monday when we know they’ll be starting practice. I’m also curious if it’s practice to record new tunes, for live shows, or both. Blu-ray screen caps should look good! I discovered it was just the Werewolf Blu-ray that was messing up the screen caps cause I tried one on The Possession with FEH and it worked fine. What, no shirtless scenes?! I think I’ve seen the trailer, so I’m good. 😉 How was the movie?